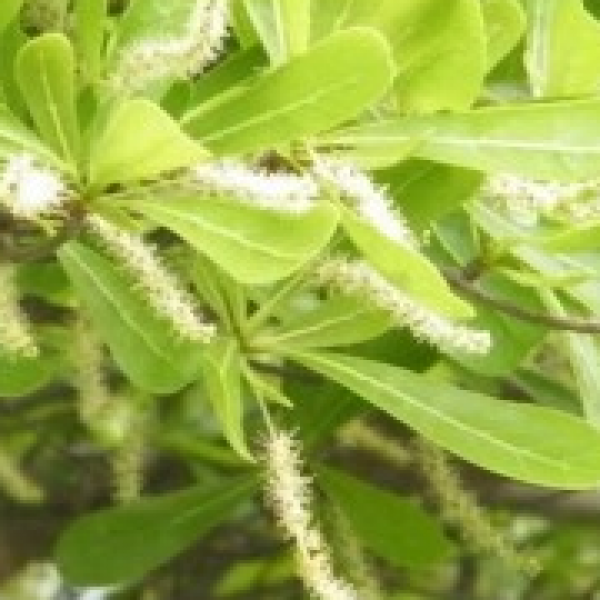 Terminalia is a genus of large trees of the flowering plant family Combretaceae, comprising around 100 species distributed in tropical regions of the world. This genus gets it name from Latin terminus, referring to the fact that the leaves appear at the very tips of the shoots. Trees of this genus are known especially as a source of secondary metabolites, e.g. cyclic triterpenes and their derivatives, flavonoids, tannins, and other aromatics. Some of these substances have antifungal, antibacterial, anti-cancer and hepatoprotective effects. The Madagascar Almond is a native of Madagascar, a land thriving with unique species of flora and fauna. The tree grows straight up and forms distinct canopies or layers of leaves that look like umbrellas. In each layer, the branches form almost parallel to the ground and branches in almost harmonic vein like patterns and ends up with small clusters of green leaves that are 4-9 in a cluster. The variegated (or tri-color) variety has beautiful green white leaves. These clusters of leaves spread out evenly to form the canopy. Due to the small green leaves, the Madagascar Almond is also suitable for Bonsai.